Amazon bills itself as a creator of jobs. Look no further than the ludicrous subsidy packages offered by cities in competition to host its second headquarters. But according to public records requests obtained by the Intercept, Amazon can drain public coffers in other ways, with five states listing Bezos’s empire as a top beneficiary of Supplemental Nutrition Assistance dollars. The issue of Amazon workers relying on food stamps may be more widespread, as this news only represents the data that’s been furnished publicly so far. But in Kansas, Pennsylvania, Washington, Ohio, and Arizona, Amazon is among the top 20 beneficiaries of SNAP—and in Arizona things are particularly dire, with one out of every three Amazon employees needing food stamps to eat. 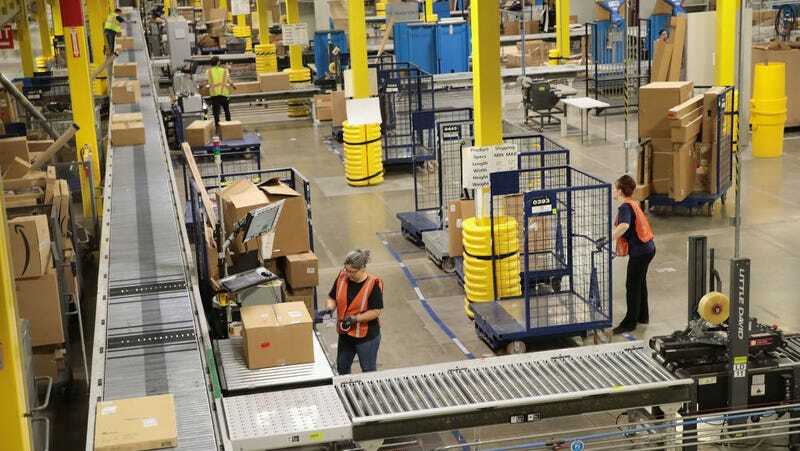 It’s a brilliant grift, taken at a distance: Amazon promises jobs—often low-skill sortation and fulfillment jobs in to-be-built warehouses in small, blighted cities without much of a local economy, like San Bernardino, California—in exchange for a buffet of subsidies. These are the same jobs that reportedly have workers spending 10 hours in a metal cage, afraid to take breaks to use the bathroom, which are themselves supported by an even more precarious glut of temporary, seasonal, and “at-will” employees who are on call, but do not have benefits or guaranteed hours. Then the number of those jobs and their expected pay is whittled down until the duped city is left footing the bill. It’s a vile business, but business is booming. Bezos, in his letter to shareholders yesterday, was happy to announce Amazon Prime now has 100 million subscribers. 4/20/18 3:22pm ET: An Amazon spokesperson reached out to Gizmodo again and asked that we replace the statement they provided with the one below. We declined. The second statement largely reiterates what they contended yesterday, with the additional information of the number of jobs and an an hourly wage figure inflated by stock options (if employees last long enough to leverage those options) and incentives. Excluded is the notion that Amazon provides a “network of support,” for whatever reason. We reached out to this spokesperson to ask if the number of jobs Amazon created last year includes part-time and seasonal workers, and if so, what their estimated hourly wage might be. We’ll update when we hear back. Are you an Amazon warehouse worker? We want to hear from you. Send us an email, or leak documents to our Secure Drop server.